If you have decided to get an iRobot Roomba vacuuming robot so you may never have to manually vacuum your home again, and if you don't want to pay the higher prices of the 900 series Roombas, but still want to get a feature rich robot that will effectively and thoroughly clean your home, you might want to consider Roomba 690 or Roomba 877. These two robots come with most of the important must-have features high quality vacuuming robots are expected to come with, without costing as much as the top Roomba robots. 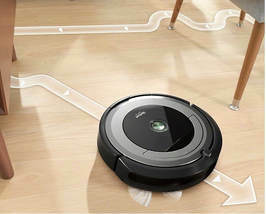 ​In this article, we will compare Roomba 690 with Roomba 877, so you may choose the robot that will respond best to your needs. This article will compare the Roomba 690 and 877 robots. 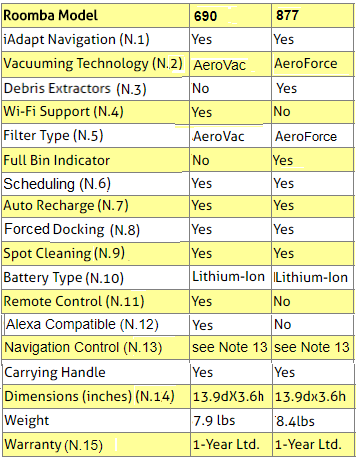 The following table compares the iRobot Roomba 690 and 877 robots. Counter-rotating dual multi-surface brushes (on Roomba 690) or counter-rotating dual multi-surface tangle-free brushes (on Roomba 877) pick up dust, debris, dirt, pet hair from the floor. Note that the tangle-free brushes are also called debris extractors. The AeroVac technology found on Roomba 690 allows for optimized airflow that pulls hair off the brushes and sends it into the bin. This allows the bin to fill more evenly requiring less frequent emptying of the bin. The AeroForce technology found ion Roomba 877 introduces the debris extractors which are dual multi-surface tangle-free brushes that replace the regular multi-surface brushes found Roomba 690. These new brushes grab and break down debris, eliminating hair tangles and jams, while an airflow accelerator creates a sealed channel that concentrates the airflow, sucking in more debris. 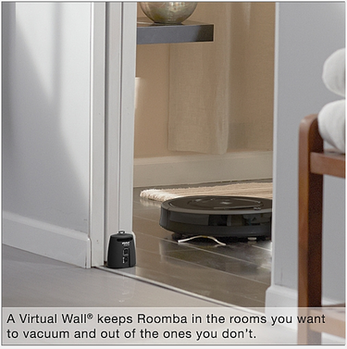 Thanks to the high efficiency vacuum, the air power is increased 5 times compared to the air power of prvious Roombas. The tangle-free brushes (also known as debris extractors) ​found on Roomba 877 grab and break down debris, eliminating hair tangles and jams, and an airflow accelerator creates a sealed channel that concentrates airflow, sucking in more debris. The AeroVac filter found in Roomba 690 handles quite adequately hair, pet fur, lint and carpet fuzz. 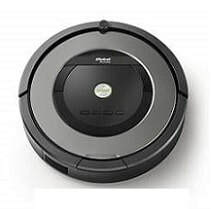 Roomba 690 can be remotely controlled from your smartphone or tablet using the iRobot Home App. No explicit remote-control device is provided. Roomba 690 is compatible with Amazon Alexa. Simply ask Alexa to start, stop, or dock your robot​. If you wish to be able to control your Roomba from your smartphone, you should consider Roomba 690, which supports Wi-Fi communications. If you don't need to control your robot from your smartphone, you would probably be more than satisfied with the vacuuming results obtained with Roomba 877 which comes with th the more powerful AeroForce vacuuming technology described above.